1. Preheat oven to 350 degrees. Line 2 baking sheets with parchment paper. Position an oven rack in the lower third of the oven. 2. In a medium bowl, knead together cookie dough and 1/4 cup flour until smooth. Lightly flour a work surface. Roll out the dough to 1/4-inch thick. 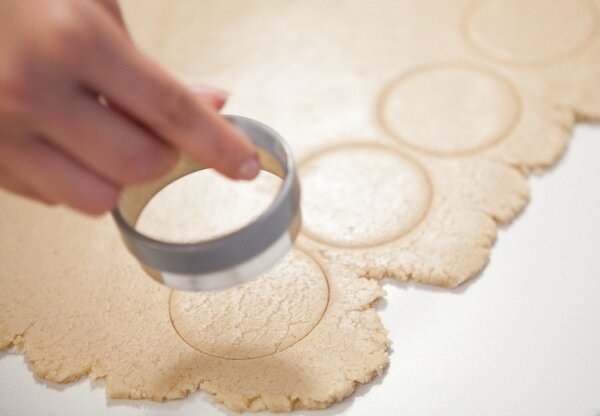 Using a 2 1/2-inch cookie cutter, cut out circles from the dough. Knead together any scraps of dough and roll out again. Continue to cut out pastry circles until there are 24 pieces in total. 3. Place the dough circles on the prepared baking sheets. Bake until cookies are slightly golden around the edges, about 10 minutes. Cool and transfer to a wire rack. Reserve 1 parchment paper-lined baking sheet. 4. Combine 1 cup of chocolate chips and cream in a small bowl. Place the bowl over a pan of simmering water and stir until the chocolate has melted and the mixture is smooth. Whisk in the peppermint extract and refrigerate mixture for 1 hour. 5. Using a 1/2-ounce cookie scoop or a tablespoon measure, place the chocolate mixture in the center of the flat side of 12 of the cookies. Place the remaining cookies on top and gently squeeze to distribute filling evenly. Place on a baking sheet and freeze until filling has set, about 25 minutes. 6. Combine the remaining chocolate chips and the vegetable oil in a small bowl. Place the bowl over a pan of simmering water and stir until the chocolate has melted and the mixture is smooth. 7. 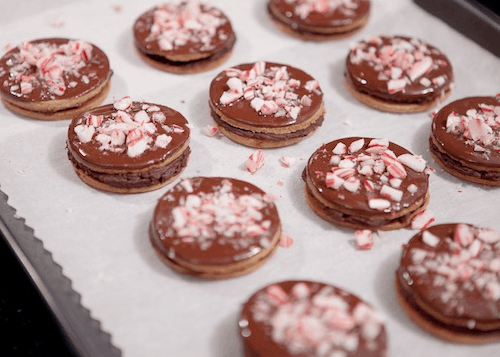 Dip the top of each cookie in the melted chocolate and return to baking sheet. 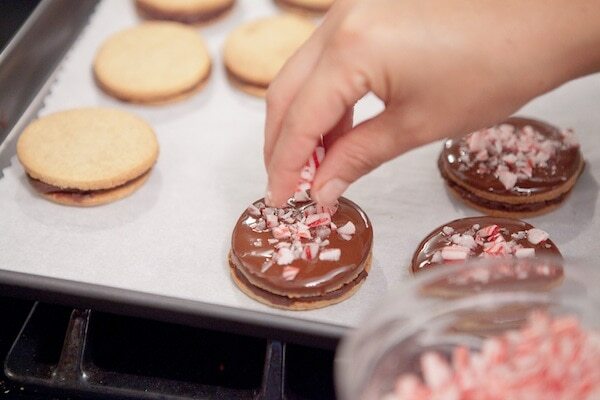 Sprinkle the tops with crushed candy canes. Refrigerate until firm and serve!